Many of us will never forget the events of September 11, 2001. Military veteran, Ed Afanador, feels the effect of those events each day of his life. Ed has served our country in the United States Marine Corps, Air Force, and Army National Guard. It was during his service in the Army that his unit was called to respond to the site of the 9/11 terrorist attacks. During the response efforts, Ed suffered multiple injuries. In addition to mobility and respiratory issues, Ed battles PTSD (post-traumatic stress disorder), which he admits, almost cost him his life. Fortunately, Ed chose to look deep inside himself, to figure out what was important to him, and decided to live life to the fullest. It was in the waiting room of the Veterans Affairs medical center in Wilmington, DE that he first heard about Canine Partners for Life. About five years ago, he met a Veterans Affairs employee with a service dog from CPL. This man noticed that Ed was having trouble walking and thought that he might benefit from a service dog partnership. 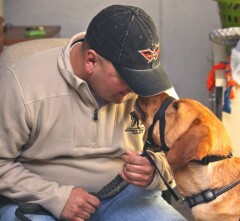 Ed contacted CPL and began the application process to receive a service dog. He says, “As an applicant, you have an idea that you’re just going to get a dog right away, but most are not prepared for the process that awaits. You know it is going to change your life, but you aren’t sure how.” In 2011, Ed met his new service dog, Arnie, and quickly learned how his life would change. Ed recalls that the day he met Arnie was one of the happiest of his life. But, the two often tested each other throughout the three weeks of Team Training. One day, Ed ran out of treats, which to a Labrador, is a serious offense. Arnie kept nodding his head over Ed’s shoulder, but Ed couldn’t understand why. It seems Arnie noticed the jar of treats behind him, before Ed did. Ed did not make that mistake again. On another occasion, Arnie refused to complete a skill during a field trip. Having a similar attitude, Ed got upset and frustrated. He eventually sat down and began talking with a stranger who sat down next to him. They talked about Arnie, and slowly, Ed released his frustration. When they finished talking, Ed calmly gave Arnie the command again and he happily obliged. That was the day Ed finally understood what the CPL trainers had been telling his class: your emotions travel down the leash and affect the dog as much as they affect you. Ed could clearly see the impact of CPL and the service dog program through his Team Training classmates. The progress they made each day and the difference their dogs made was evident. He noticed the impact on his own life the first time he ended up in the hospital after graduating with Arnie. Having Arnie in tow changed the demeanor of everyone around him, including the doctors and nurses. Suddenly, everyone was so positive and understanding. They loved to be around the dog and made Ed’s experience all the more comfortable. As Ed and Arnie grow as a team, Ed has realized that a service dog “understands what your needs are, more than you know yourself.” He and Arnie take every opportunity to spread the word about CPL, just as that Veterans Affairs employee did five years ago. They often attend demonstrations and speaking engagements to educate the community about the service dog industry, specifically CPL. Ed sometimes gives presentations to veterans and even presents at his son’s school. He recently met someone with Type 1 Diabetes who may benefit from our new Diabetes Alert Dog Program and suggested they contact us. Through his partnership with Arnie, Ed has been able to spend more time with his family, volunteer to help others with disabilities, and even play adaptive sports. 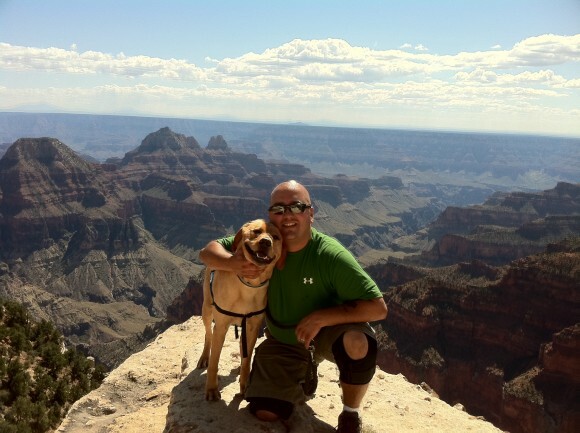 Ed says of Arnie, “This dog has never let me down,” and together, they have traveled extensively, including Disney World and the Grand Canyon. The bond between them is so strong that Ed claims Arnie, “got me out of my shell and saved my life.” Ed believes partnering with a service dog is not just life-changing, but can save someone’s life. Ed and Arnie are a perfect example of CPL’s mission at work!